Though I attended Parsons School of Design in the ’70’s, I am now a psychotherapist. I had not been drawing or painting for many years when I first walked through the doors of the New York Academy of Art (NYAA) in 2006 for a class titled “Beginning Painting and Drawing.” The teacher was an artist whose work I greatly admired, and I was quaking in my pencil box! I wanted to learn to draw and paint like a realist, and my expectations far exceeded my skill-level. The lessons since have been of self-mastery and beauty, as much as pencils, paint and paintbrushes. My involvement in the learning process has been passionate. I take each of my teacher’s lessons to heart, artistically and metaphorically, and use them in my life and work as a psychotherapist as well. My teachers encourage me to experience beauty while learning to draw and paint. One of the first lessons is to understand the beauty of chiaroscuro, the study of light and dark in drawing and painting. The lesson, essential for an art student, also serves me well in valuing the lights and darks of life. Light and dark need each other to make a whole of anything. 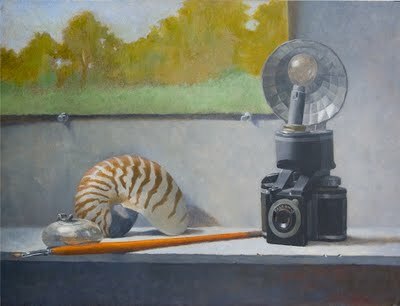 In art and life, our many preset assumptions reveal how much we do not know. I am still learning to “draw what I see, not what I think I see.” For example, when drawing a picture of an eye, a beginner will very often draw or paint the eye too round, wide or short, in a symbolic almond shape. Not until a teacher points out the numerous interacting shapes, colors and beautiful nuances in an actual eye, will the artist begin to observe and be inspired to practice drawing and painting what is actually there. My art teachers have little patience for negating, non-constructive self-assumptions or self-criticism in their students. It gets in the way of the process, practice and joy of teaching, and learning to draw and paint. Rather, “inner-critiques” are redirected towards developing intelligent questions, skills and a “discerning eye.” This requires a particular attitude of open, engaged inquiry, both in the moment and in the long-term service to one’s goals. As a focusing-oriented person, my “bodily felt sense” directs me as I draw and paint. It inspires, informs and infuses my work with the felt-atmosphere of a moment by moment experience and relationship with my subject. The point of learning technique in art is to transcend it. The beauty is in experiencing the “stepping through” process. Naturally, my expanding awareness is applied to my life and work. As I am gaining the skills of mindful observation for drawing and painting, I find myself able to listen more fully, and deeply value for myself and others. Meeting another person, unrestricted by assumptions, is an invitation to be present, make room for the lights and darks, and genuinely relate. If we look for it in art and life, we see people in a beautiful light. What beauty there is in your descriptions….and what clarity….What you say is so relevant to my own practice of focusing-oriented therapy, as well as my taketina rhythm training, and your words inspire me to write my own…..which will be coming soon, I hope. Many thanks for sharing your experiences with us! Thank you truly Lillian, for this awesome collection of Rumi’s poetry, and for your lovely words and sense of it all.